How to fix QtWebEngineProcess.exe process taking too many resources? 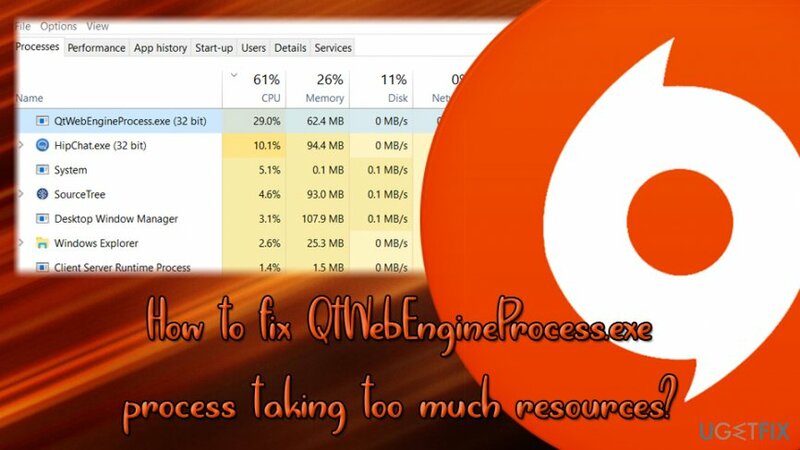 Home »	Fix » How to fix QtWebEngineProcess.exe process taking too many resources? Issue: How to fix QtWebEngineProcess.exe process taking too many resources? Hi guys. I have recently noticed that my computer is running louder and the fans are spinning faster. To find out what is causing it, I opened Task Manager and saw a process called QtWebEngineProcess.exe running. In some cases, I can see several instances of it running, and taking up to 200 MB of RAM and 20% of CPU while I'm not even doing anything with my computer. How is that possible? Is there some sort of bug? And what is the process for? Please help me! QtWebEngineProcess.exe process is typically related to Origin gaming platform developed by Electronic Arts which is similar to Steam. Users can purchase, download, install and update games, save game progress, manage the user profile, stream via Twitch TV, and even share a game library with sites like Xbox Live, Facebook, PlayStation Network, and similar. To make use of this platform, gamers have to download Origin client available on the official website. Just like many other applications, Origin is presenting updates to improve its stability, security, improved configuration, and other factors. However, one of these updates can bring QtWebEngineProcess.exe to the system which sometimes causes a high amount of CUP used. According to some users, it consumes almost the same amount of resources as Origin.exe without even doing anything. Some users offered to close down the client running in the background. However, it is not the answer to the problem, as, if the game is launched, computer resources would jump up even more and slow down the computer. Therefore, our team piled up a few solutions for this problem and hopefully you can find a way how to fix QtWebEngineProcess.exe taking too many resources. Alternatively, the QtWebEngineProcess.exe process can be related to Ring Central, BitLord, Steam, Glyph, PlayTV, programs or some browsers. The file is digitally signed by DropBox. QtWebEngineProcess.exe has encountered a problem and needs to close. We are sorry for the inconvenience. QtWebEngineProcess.exe is not a valid Win32 application. Because it is an executable file, we suggest you scan your device with Reimage to make sure that it is not misused by malware, including trojans, backdoors, ransomware, rootkits, spyware, worms, etc. 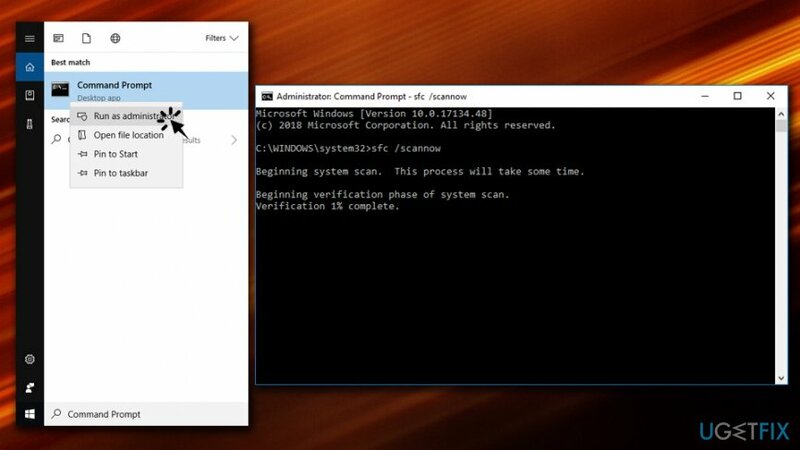 We suggest this procedure in the first place because malware tends to use the names of legitimate processes to disguise itself as a legitimate system component. You should be extremely suspicious if the executable is located in C:\\Windows\\ or C:\\Windows\\System32, and not in C:\\Program Files. If the scam came up clean, follow the methods presented below. 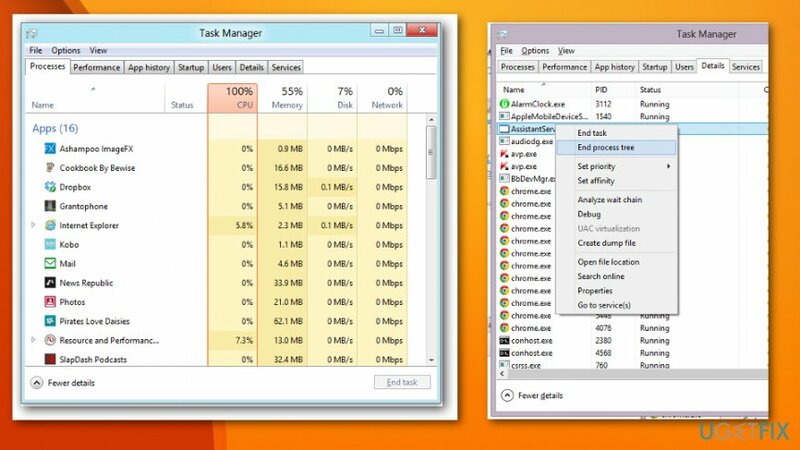 You can use Task Manager or system monitoring program that provides information about processes running in the background. You can also indicate the use of computer resources like CPU, using these features. Start the Task Manager and find QtWebEngineProcess.exe process. Right-click on it and choose End task. You can also find out which software is using this file and causing issues on the system. Right-click the QtWebEngineProcess.exe in the Task Manager and select Open file location. Determine if the software is legitimate and important. 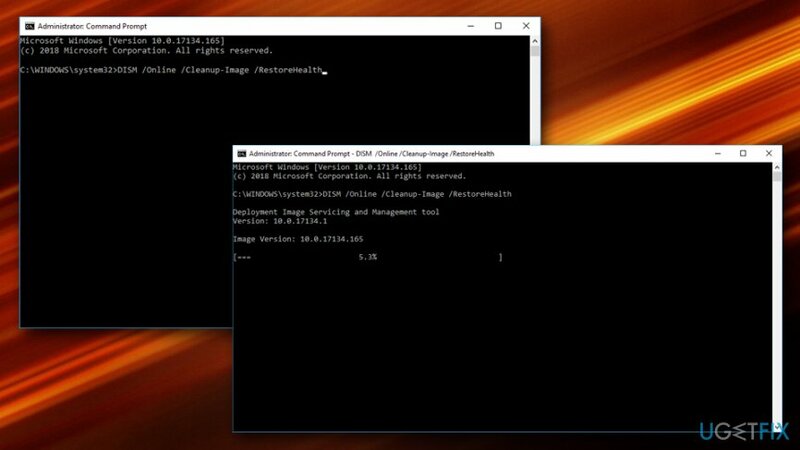 If the process is associated with a Windows OS program, you should keep it on the device. 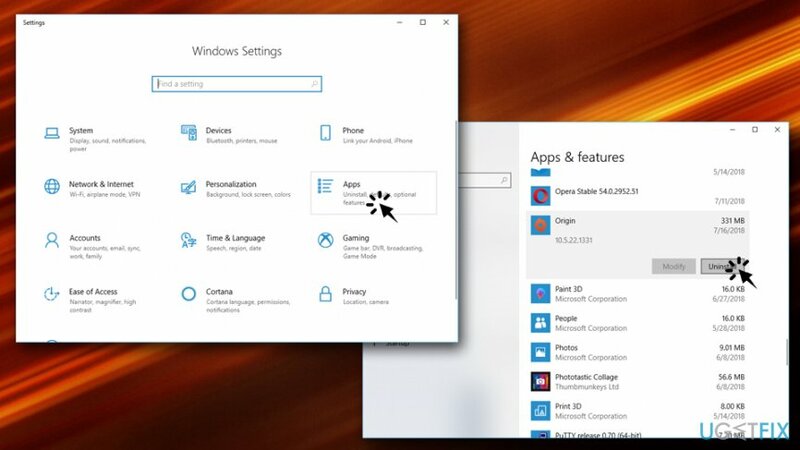 You can employ this Windows OS feature to undo the recent changes and restore of your OS to a previous state. Locate or search for System Restore. Enter the administration password if needed. Choose the restore point and follow with the process. The issue with executable files may be caused by outdated drivers or software, so you may need to check for possible updates and the issue with QtWebEngineProcess.exe errors could disappear. You can use driver updater tool that indicates all outdated drivers and update them at the instance. Also, you can check for updates manually for each one but this method takes time and installing a bad driver can cause more problems. Microsoft is constantly updating Windows systems and since QtWebEngineProcess.exe may be associated with OS programs you should find available updates and install them as a solution for resolving the issue. Enter Update to a search box and press Enter. When Windows Update dialog windows appear it shows if there any available. 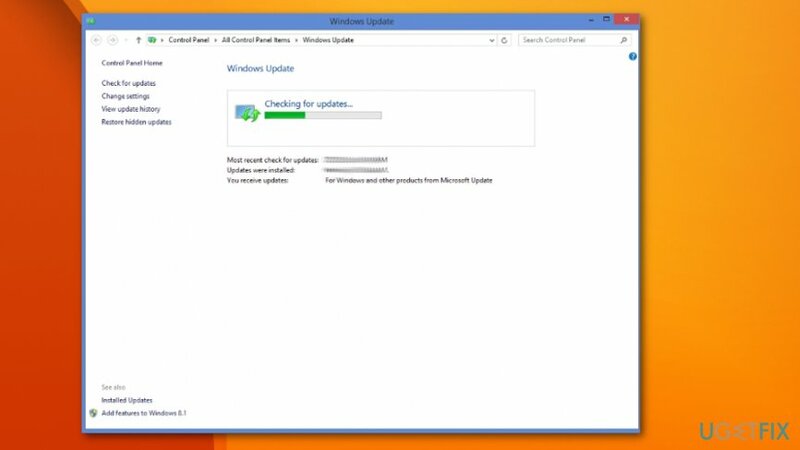 If there are recent updates click Install Updates and proceed with the installation. ^ Official website. EA. Electronic Arts official website. ^ Eric Qualls. What Is Xbox Live?. Lifewire. Tech untangled. ^ PlayTV. Wikipedia. The Free Encyclopedia. ^ Rootkit: What Is a Rootkit, Scanners, Detection and Removal Software. Veracode. APPSEC knowledgebase. Wie behebt man, dass der Prozess QtWebEngineProcess.exe zu viele Ressourcen verbraucht? Comment Corriger le processus QtWebEngineProcess.exe exploitant trop de ressources ? Jak naprawić problem z procesem QtWebEngineProcess.exe pobierającym za dużo zasobów? ¿Cómo solucionar que el proceso QtWebEngineProcess.exe tome demasiados recursos?